Moscow: Russia does not intend to be the first to place missiles in Europe but will develop its defense capacities and take reciprocal measures if the United States deploys missiles, President Vladimir Putin said Wednesday in his address to Russia''s Federal Assembly. "Russia will be forced to create and deploy weapons that can be used not only against areas, from which a direct threat will emanate, but also against the centers making decisions on the use of missile systems that threaten us," Putin said. Speaking about the intention of the United States to withdraw from the Intermediate-Range Nuclear Forces (INF) treaty, Putin said that Washington has been violating the benchmark disarmament deal. By launching intermediate-range missiles under the guise of "target missiles" and deploying launchers suitable for using Tomahawk cruise missiles in Romania and Poland, the United States violates the requirements of the treaty "directly and grossly," Putin said. This will dramatically aggravate the situation in the field of international security and create a serious threat for Russia, because for some classes of these missiles, the flight time to Moscow only takes 10 to 12 minutes, Putin said. Russia therefore will be forced to respond both with "mirrored and asymmetric actions," he said. Putin stressed that Russia wants peace with all countries, including the United States, but it will develop its military might to protect itself against any threat. "For a stable and long-term development we need peace," Putin said in his annual address to the Russian parliament. 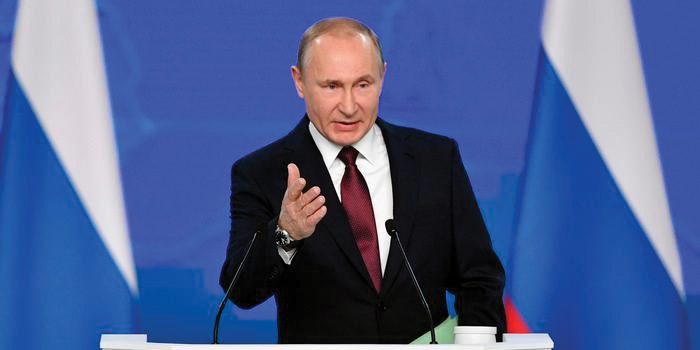 "And all our work aimed at increasing our defense capacity has the only goal -- to guarantee the security of our country and our citizens so that nobody would dare not only think about an aggression but even about trying to use pressure methods on our country," Putin said. Russia is not interested in any confrontation with a global power such as the United States, with which it wants to have full-fledged, equal and friendly relations, he said. He added that some people at the top in Washington are still obsessed with the idea of exclusivity and superiority over the rest of the world. He suggested that these people should first calculate "the reach and the speed of our prospective weapons" before making decisions that could seriously threaten Russia.